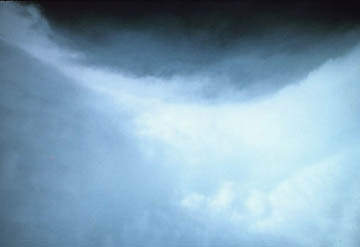 A rare view from inside the eye of a hurricane - this was Hurricane Allen on August 7, 1980. At the time this photo was taken, Allen was just entering the Gulf of Mexico through the Yucatan Channel. Scientists aboard a reconnaissance flight into the storm measured a barometric pressure of 26.55 inches (899 mb) and sustained winds of 190 mph. Photo courtesy NOAA Photo Library 1980. Hurricanes Charley, Frances and Ivan between August 13 to September 14, 2004, have been Category 4 and 5, an unprecedented event in American recorded weather history. The National Hurricane Center says Ivan has had the 6th lowest barometric pressure on record. Hurricane intensity is measured using the Saffir-Simpson Scale, ranging from one (1) (minimal) to five (5) (catastrophic). Cat 3-5 hurricanes have caused over 70% of American natural disaster damage. Source NC Division of Emergency Management Hazard Mitigation Section. September 14, 2004 Greenbelt, Maryland - In a four-week-period from August 13 to September 16, 2004 - for the first time on record in American weather history - three major Category 3 to 5 hurricanes made landfall in the southeastern United States. Charley intensified to a Category 4 hurricane and made landfall with winds of 145 mph, and gusts that topped 180 mph in Punta Gorda which was devastated along with Port Charlotte on August 13. Charley cut a huge swath of upturned trees, downed power lines, flattened trailer homes, destroyed houses and businesses all across central Florida, including Orlando, and killed at least 27 people.